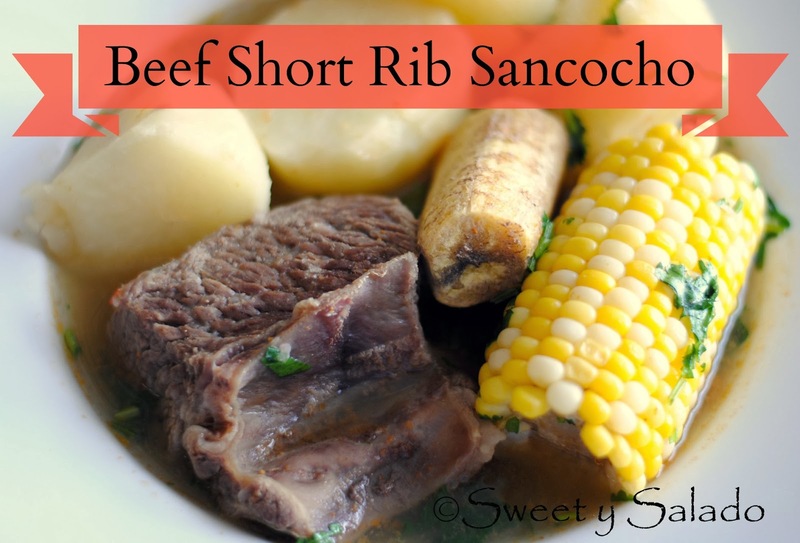 One of my husband’s favorite Colombian meals is sancocho, preferably hen sancocho, but whenever I make this beef short rib sancocho he ends up eating up to three plates. In Colombia, sancocho is a very special soup, as soon as you say that you’re making it, everybody starts getting ready to sit at the table and share it with the rest of the family. The funny thing is, I’m not a big fan of it, I mean, I like it if it’s made with beef short ribs and if I eat it once in a blue moon. As for hen sancocho, I would rather not eat it, ever, and that’s why I rarely make it. Besides, finding a whole hen here in the US is not an easy task. 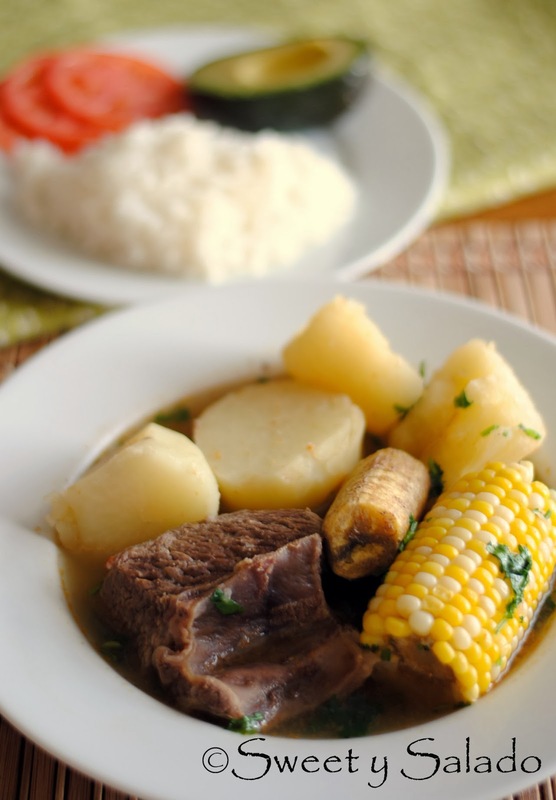 For those of you who don’t know what this dish is, sancocho is simply a soup made with root vegetables like potatoes, cassava (yuca) and/or “arracacha“, which is a root vegetable found in the Andes. It also has green plantains and corn. The star of this soup is the meat, it can either be beef, pork, chicken or hen. You put everything in a pot with lots of water, cook it and serve it with rice and avocado. I have seen that the sancochos made in other Caribbean countries have a lot more ingredients but the Colombian version is a bit more simple and less complicated. For this video I had the pleasure to collaborate with another YouTube channel that I’m a huge fan of called, Fudehouse. I invite every single one of you to visit this channel because it is like no other out there since Jeff, its creator, does a fantastic job of teaching you great cooking tips and techniques in a fun way. Below you will find the link for the video he made for our collaboration where he’ll show you everything related to beef short ribs such as where they come from on the animal, what to look for when buying them, the different ways to cut them and what they are called at the butcher/supermarket, all that fun stuff. I hope you enjoy it! 1. Add the short ribs, water, aliños, salt and pepper and cumin to a large pot. Cover and bring to a boil at high heat. Once it is boiling, reduce the heat to medium low and cook for about 45 minutes. 2. Uncover the pot and with the help of a spoon, skim off the fat that is on the surface as much as you can. 3. Add the corn, green plantain, potatoes and cassava. Add more water to cover all the ingredients if needed. Cover and bring to a boil at high heat again. Once it is boiling, reduce to medium low and cook for another 30-35 minutes. 4. After it has cooked, add the cilantro and taste for seasoning. Add more salt and pepper if desired. 5. Serve immediately with white rice, avocado, Colombian hot sauce,Colombia green hot sauce, or hogao. Hi! Can oxtail be used instead of short ribs? Thanks! You can, but oxtail takes longer to cook, so I would cook it for about 1½ hour or 30-45 minutes in a pressure cooker, instead of the 45 minutes it takes you to cook the short ribs. Just an add. Thanks for the recipe. Colombian born, US raised and didn’t quite get the kitchen tips since I’m the youngest of 20 and they kept throwing me out of the kitchen. Recipe came out great! But second day Sancocho is great! Going to try your Arroz con pollo next. Keep up the great work.